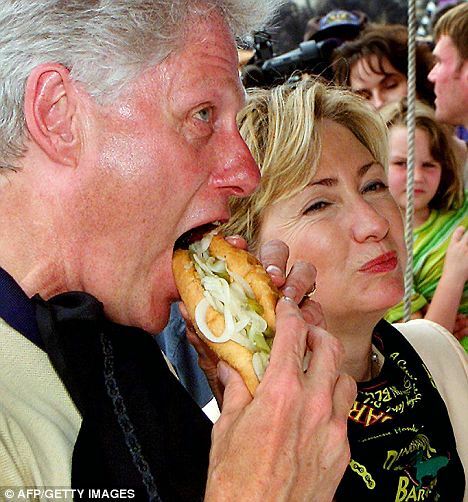 Bill Clinton is known as a vegan now, though he was once a ravenous diner with an insatiable hunger, Roland Mesnier, the former White House pastry chef, revealed. The former White House pastry chef added that his kitchen staff “had to be ready”. Roland Mesnier, who has been making pastries for presidents for a quarter century, told the Washingtonian that cooking for the president was no easy feat. For one thing, Bill Clinton is allergic to both flour and chocolate. For a pastry chef, this could be frustrating, Roland Mesnier said. The former chef remembered one night he crafted a strawberry cake for the president. He said Bill Clinton devoured half of the cake – without help from Hillary or Chelsea – and then wanted a slice or two in the morning. “No one could find the cake,” Roland Mesnier said. When the missing cake was nowhere to be found, there was only one conclusion to be made. “We decided (Vice President Al) Gore must have eaten it,” Roland Mesnier told the Washingtonian. Roland Mesnier served everyone from President Carter to President George W. Bush, but left before his second term. The French chef is the author of three books, including his memoir, All the Presidents’ Pastries. Bill Clinton, who is now 65, said his vegan diet is serving him well. “I like the vegetables, the fruits, the beans, the stuff I eat now,” Bill Clinton said. While in office Bill Clinton, who has a family history of heart disease, was well known for gorging on fatty snacks like doughnuts, burgers and steaks as he worked long hours in the Oval Office. Bill Clinton had to make more changes last year when doctors implanted two stents to open one of the veins from that surgery. After taking advice from U.S. diet guru Dr. Dean Ornish, Bill Clinton appeared noticeably thinner last August at daughter Chelsea’s wedding, where he revealed he had lost 20 lbs. Bill Clinton told CNN that he realized he had been playing “Russian Roulette” with his body because even though he had cut down on some unhealthy foods, he was still taking in too much cholesterol.